Barack Obama is the 44th President of the United States of America, the symbolic leader of the country. His presidency began in 2009 and continues to the present day. 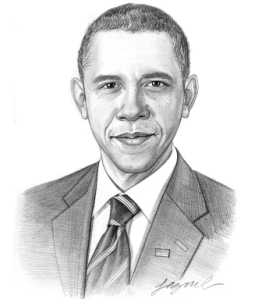 He was 47 years old when he first began his term of office on January 20, 2009. His full name is Barack Hussein Obama, after his Kenyan father. One of his nicknames is 'Barry' or 'Bar', an abbreviation of his first name. His most famous nickname is 'No Drama Obama'. This nickname was coined by General Tony McPeak, a retired Air Force Chief of Staff, who called President Barack Obama 'No Drama Obama' because of his careful and faultless presidential campaign. Other nicknames include The Teleprompter in Chief, The Bamster and The Depression President. The picture of Barack Obama portrays an interesting image of what this famous man looks like. The picture shows the clothing and the hairstyle that was fashionable during his presidency. He is described a tall, slim and imposing figure, being 6 feet 1 inches in height and 180 pounds in weight. He had brown colored eyes and his dark hair has turned gray with age. A handsome man with a smooth, brown skin with even features and straight, white teeth. Aware of the importance of the media he wears fashionable clothes appropriate to the situation, both formal and informal attire. Character and Personality Traits: What was Barack Obama like? The personality of Barack Obama is described as highly intelligent, ambitious, caring and diligent man. He pays attention to detail which resulted in his nickname 'No Drama Obama' reflecting his careful and faultless presidential campaign. He is open minded and seeks a variety of opinions before making important decisions. Viewed by many as a visionary he has the ability to inspire people with confidence. The important role and duties of the President of the United States of America include those of Chief of State, Chief Diplomat, Chief Executive, Commander in Chief, Legislative Leader and Leader of his own political party. What was Barack Obama famous for? Why was Barack Obama important? The history and life of President Barack Obama during his presidency is conveyed in the following fact file in an easy question and answer format. What President is Barack Obama? He is the 44th President of the United States of America. The dates of his presidency began in 2009 (January 20, 2009 to Present). What is his political party? What other political offices did Barack Obama hold before his presidency? Who is his Vice President? What were the main events and the major accomplishments of his presidency to date? What is Barack Obama' nickname? Who is Barack Obama' s first lady? Barack Obama was famous for the events and accomplishments of his presidency, but what are the facts about the man and his private life. Facts and information about the private life of Barack Obama can be found in the following fact file in an easy question and answer format. When and where was Barack Obama born? The name of his father was Barack Hussein Obama, Sr.
Where was Barack Obama educated and what was his religion? What did Barack Obama do before he became President of the United States? Who is Barack Obama's wife and when did they marry? What are the names of their kids? We hope that the picture, facts and information on President Barack Obama will prove helpful to kids, school children and schools learning about the presidency of this famous American leader. The facts about Barack Obama provides an overview of the President's character and personality traits. Watch the video and learn more about the major events of his life and his accomplishments. The following Barack Obama video is a useful educational resource for kids, children and schools learning about the life of the US President Barack Obama.